Acquisition will increase awareness and use of new top level domain names. Domain name registry Donuts has acquired link management company BudURL and rebranded it as BL.INK. Donuts quietly completed the acquisition of the Austin, TX company last year. Since then, it has been enhancing the system and developing a way for registrars to offer it to their customers as a value-added service. Like many link shortening services, BL.INK enables customers to create shortened links based on their domain name or to use system domains. 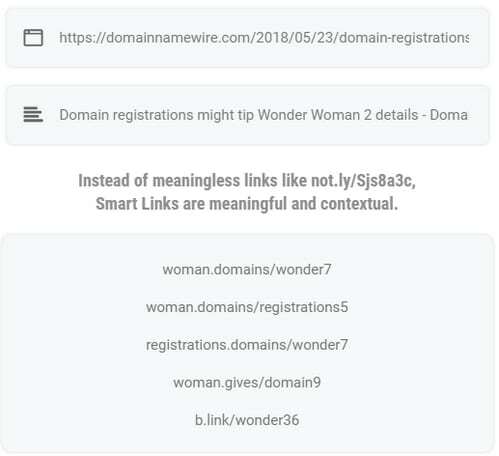 What makes BL.INK interesting is that it taps into Donuts’ inventory of over 240 top level domain names* to create contextually-relevant links. With Twitter expanding its character count, the length of a “short” link is no longer a restricting factor. Donuts is betting that links will perform better when they are relevant to the page topic. The company commissioned a survey to understand which types of links people prefer to see, and most prefer short links with real words rather than character strings, the company says. The acquisition makes sense for Donuts. BL.INK will certainly introduce more people to new top level domain options. Donuts can also leverage its existing domain name registrar channel to sell the product. Registrars hungry for higher-margin products can offer a white label version of BL.INK to get additional subscription revenue and sell more domains, or they can get paid for referring customers directly to BL.INK. BL.INK also has a number of enterprise clients that provide stable recurring revenue. Clients include Coca-Cola, Target and Airbnb. A free plan (including the ability to connect a custom domain) is available. Paid plans with higher limits and more features start at $12 a month. So ugly domain owner bl.ink also owns b.link? I like b.link, why not use the better name? Brilliant addition to Donuts’ brand-building toolbox.